Longtime Georgia Southern coach Jack Stallings, left, was the school's all-time winningest baseball coach. 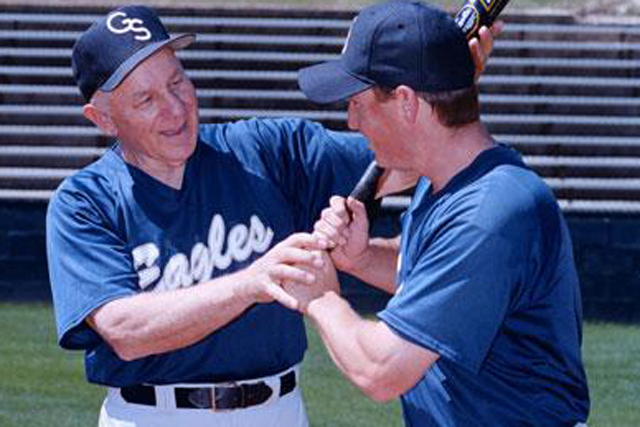 Longtime Georgia Southern baseball coach Jack Stallings passed away on Wednesday. He was 87. Stallings helped put Georgia Southern baseball on the national scene. In 39 seasons as a collegiate head coach, Stallings finished with an overall record of 1,257-799. He took over the Georgia Southern baseball program in 1976 and coached the Eagles until he retired in 1999. In his 24 years in Statesboro, Stallings had a record of 859-581-5. He helped Georgia Southern make an appearance in the College World Series in 1990. Under Stallings, the Eagles made five postseason appearances (1979, 1980, 1987, 1990 and 1996), four Trans America Athletic Conference championships (1980, 1985, 1986, 1987) and three Southern Conference titles (1993, 1996, 1997). Stallings also coached 22 All-Americans at Georgia Southern. His No. 1 jersey was the first baseball jersey retired at the school. "The winning was satisfying, but even more satisfying was seeing players grow and mature," Stallings told the Savannah Morning News. Stallings also served as head coach at Wake Forest (1958-1968) and Florida State (1969-1975). He took FSU to the College World Series in 1970. Stallings coached in the 1984, 1988 and 1992 Olympic Games. He was also a two-time United States National Team Coach in 1970 and 1973. "I'll never forget when I got the job here (as GSU's athletic director) I was in Stallings' office and one of his former players from Florida State had driven completely out of his way to visit with Jack," former Georgia Southern athletic director Sam Baker told the Savannah Morning News. "That told me a lot about the impact he had with his players. "We were lucky to have someone of his stature here. And he didn't just reach out to the student-athlete but the students as well. (Stallings) did a lot for Georgia Southern and baseball, nationally and internationally, and he did it in a quiet manner."